Labour Economics is devoted to publishing international research on empirical, theoretical and econometric topics that are of particular interest to labour economists. In particular, Labour Economics gives due recognition to solid empirical work with a strong economic interpretation. From time to time Labour Economics publishes review articles and articles on comparative labour market policies. Special issues and special sections of Labour Economics are available for the publication of collections of high quality topical papers or conference papers. 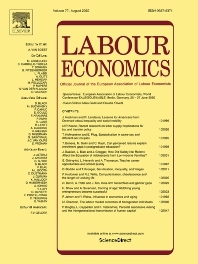 To improve the speed and quality of decisions, Labour Economics encourages authors to provide information relating to prior submission of the paper at other journals. Please include the editor's letter and referee reports accompanied by a response letter. Labour Economics reserves the right to use its own referees and provide these referees with copies of this correspondence. Submission to the journal is free to EALE members. You can easily become a member of the Association here at the cost of EUR 47.50. Membership is for the current calendar year. When you submit your paper, you will receive an email confirming receipt of your paper. If you do not wish to become a member of EALE you should follow the guidelines in the email regarding how to send your payment - of EUR 75, USD 100, Y 8,000. The submission fee revenue is used to support journal related activities and is non-refundable. A paper may be rejected by the Editor without being sent for review - if the paper is inconsistent with the aims and scope of the Journal as set out on the Journal website, or if it does not meet professional standards. Please check that Labour Economics is the right journal for your paper before submission.